This weekend on my adventures I was invited to perform at a beautiful wedding in Leamington spa. Normally I perform many during the drinks reception or between courses but on this occasion I was booked to perform for only three tables for a small intimate wedding. This worked really well and I performed different ‘set’ at every table. The intimate nature meant that everyone had full attention to witness the magic and they were completely amazed. To complete the event I performed in front of everyone, (and embarrassed the groom) and it all worked out really well. I invariably perform at about 30 weddings per year but I don’t perform at wedding fairs or wedding shows as I am usually about performing. You can also follow me on Facebook, Twitter, linked in and my blog. ….. remember when booking Alex, it is not just a leap of faith and hope for the best. 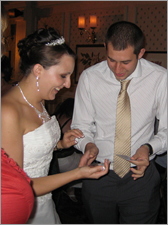 Alex is the consummate professional having performed all over the UK and won many awards for his magic.